Today our private Morocco tour starts visiting Hassan 2 mosque, then Casablanca beach, the justice court and the Habous quarters. 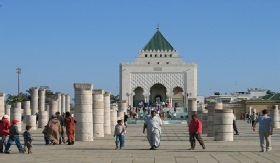 Then we drive to Rabat which is an administrative capital of Morocco where we will visit Mohamed V mausoleum, the Royal Palace gardens, the Oudaya gardens and the Chellah. This night we will spend in local riad in Rabat. After breakfast our private Morocco tour continues driving towards Meknes , an imperial city that rose to prominence with the sultan Moulay Ismail ( 1672- 1727) who set the capital of Morocco to Meknes and gave it its golden age by building his imperial palace, city walls and kasbahs. 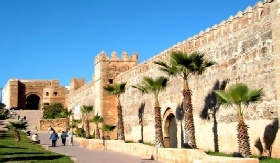 Our visit places of interest include the gate Bab El Mansour, Masoleum of Moulay Ismail, the imperial Palace and the royal granaries and stables. Overnight in Meknes with dinner and breakfast. 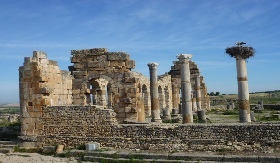 After breakfast we drive to the Roman ruins of Volubilis with its Galem’s baths, basilica, capitol and forum and the sacred village of Moulay Idriss. 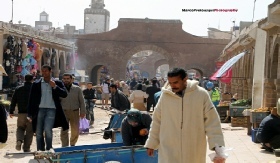 Then we’ll arrive in Fes where we will have free program and u may discover old medina by yourself. In the evening we will have dinner and we spend this night in a local riad in Fez. 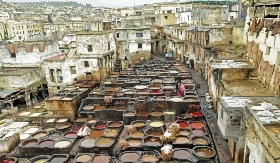 Our private Morocco tour continues in Fes, and we visit the spiritual and cultural Capital of Morocco. We spend the morning exploring ancient Fez medina, then Royal Palace ,we drive through the Mellah , the old Jewish quarter, also Bab boujloud. We will visit to labyrinthine Fez El-Bali, Morocco's largest medina ,then the 17th century medersas (schools), the Karaouine University. The old Medina is classified as a UNESCO heritage world site. This night we will spend in riad in the medina. Today we start our private Morocco tour driving south towards Merzouga desert, crossing the Middle Atlas mountains. We will enjoy breathing the pure air that comes from the Cedar forests. We will have stops for taking pictures in panoramic views, driving through Ziz valley and palm groves of Tafilalet - oasis. After we arrive to Erfoud, we will visit the marble factory for the production of fossil. Then we continue to Rissani to explore its local souk, then we continue to Merzouga desert where we spend this night at local riad. Today you will experience the lifestyle of the Nomads in our off-road excursion by 4x4 to the breathtaking Erg Chebbi desert. Here we will visit the Nomad families who live in desert tents, later we will attend local music/dance performance in Khamlia village. After breakfast our private Morocco tour continues and we enjoy sunrise in desert. Then we ride camels back to village and we depart the desert via the ancient desert town of Rissani heading to the dramatic Todra Gorges passing Tinjdad and Tinghir. We will walk at Todra Gorges along the river. We will have a lunch at local restaurant under 600 feet high red cliff of the gorges where you may see many of rock climbers. Later today we continue to Boulemane Dades where we visit the gorges . The night will be in local riad in Dades Gorges. Today we drive through Kalaa Magouna and the road of thousands Kasbah. 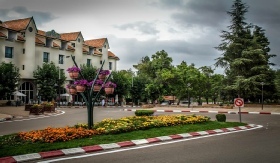 The Kalaa Magouna is famous for its roses and rose products, every year a rose festival is held in May. 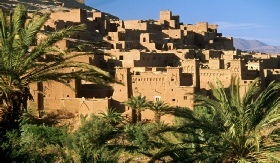 Then we continue to Skoura to visit local Kasbah Ameridil. 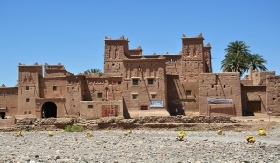 Then we drive to Ouarzazate to visit local film studio and then we visit nearby Kasbah of Ait Ben haddou, where many famous movies were shot (The mummy, Gladiator, Lawrence of Arabia). After lunch in a local restaurant over looking the Kasbah we will return to Ouarzazate where we stay in the night at local riad / hotel. Today we continue to the top of the Atlas mountains, crossing the T’ichka mountain pass at 2260 meters. We arrive in the afternoon to Marrakech and we stay here for this night. 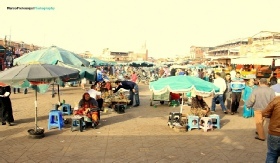 You can explore nearby Jamma el Fna square easily by yourself. Today after the breakfast, we will explore Marrakech and our private Morocco tour includes visiting of best places of this the red city Marrakech. We will explore Menara, the minaret of Koutoubia (the Twin tower of Giralda in Seville, in Spain), the tombs of Saadian which being composed of the splendid mausoleums built at the 16th century, the gardens majorels. After lunch we will explore souk near famous Jamaa Efna square. You will have also possibility to explore this square by yourself. We stay overnight in local riad in Marrakech. Today we will visit Essaouira on Atlantic coast. We may have chance to see goats climbing the Argan trees just before we reach Essaouira. We will also visit the women’s co-operative of Argan oil. 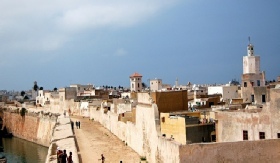 In Essaouira we will visit local medina surrounded by ancient city walls. We also visit local fishing port. We will stay in Essaouira for this night in local riad. Toda we finish our private Morocco tour and we drive back to Casablanca via Eljadida city.